The natural environment around Sheffield and North Derbyshire will feature in a show garden for the 2018 RHS Chatsworth Flower Show. ‘The Great Outdoors‘ designed by Phil Hirst, will bring a taste of the woodland and moors of the area, evoking the beauty of the countryside. The garden will be a place to relax and enjoy the great outdoors and demonstrate how we can bring the countryside into our own gardens. The garden features oak as a hard-landscaping material which will be used in different ways. A feature pergola made to an irregular design inspired by the branching trees of the local woods will be a focal point and oak will be used as paving material through charred decking redolent of the peaty moorland and timber setts. Charred oak boards will be used as a feature screen around the boundary. This will play with the light and evoke the rocky gritstone ‘edges’ of the northern Peak District and South Yorkshire moorland. Oak benches will ‘appear’ to float above the ground while a mysterious water feature will flow through the centre of the garden evocative of the dark moorland peat bogs. Planting makes reference to the native plants found in the area but will still retain the sense of being in a garden rather than a wilderness. A multi-stemmed birch tree and oak tree will reflect the native woodland of the area while Brunnera ‘Jack Frost’ and Hosta ‘Blue Angel’ will bring a garden aspect. Other plants will include Hebe vernicosa, Hebe armstrongii and Festucca ‘Golden Toupee’. Phil leads a design practice based in Sheffield and works across Yorkshire and Derbyshire. He is excited to be creating his second show garden on his home turf with a garden inspired by his walking the dog. He created his first show garden at the 2013 RHS Tatton Park Flower Show, where he won a Gold medal and Best Large Garden award for A Stainless Century. Phil points out that the countryside around Sheffield is truly beautiful: “A few minutes out of the city is a landscape of sheep-grazed meadows, bleak heather moorland and ancient oak and birch woods with towering grit-stone crags protruding out. Reflections of this countryside have been recreated in this garden,” he says. 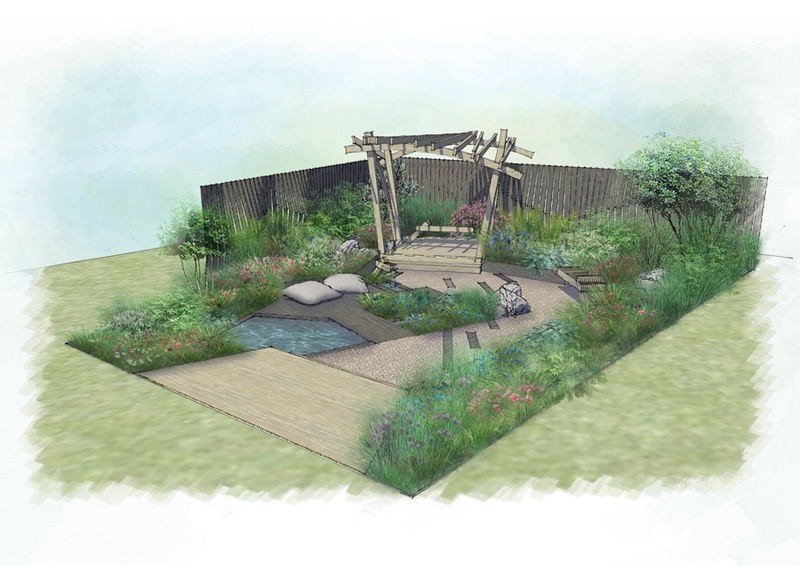 The garden is sponsored by Allgreen Group, Handspring Design and Knowl Park Nurseries and will be built by GardenStyle, a Sheffield based landscape company.